The first day at school could easily be stamped as stressful, confusing and often overwhelming for any student. Nonetheless, attending an entirely new school is bound to heighten these concerns. Our privileged orientation for students is meant to lay bare an opportunity to gain an understanding of Manchester International School’s thriving and peerless culture, followed by fervent formalities, wherein the students are guided towards identifying the locations of their classrooms, a brief introduction to their teachers that culminates with the short interaction with their batch mates and classmates in the ensuing academic year at school. Apparently, these maneuvers are aimed at alleviating the initial apprehensions and anxieties that the students are being confronted with on their admission in a new school. It should be reiterated that the aforementioned apprehensions do apply to the parents, as well. It remains as no strange phenomena when parents tend to turn out equally anxious, if not more, on admitting their children to a new school. Manchester International School gladly accommodates the parents for an all-inclusive orientation episode, which is looked upon as a fixated fundamental exercise focused on facilitating their experiences and that of their children at the great school. During the parent orientation programme, we will go over our different forms of communication, ways to get involved, and have a question and answer time. The team will be also holding a welcome gathering that will give parents an opportunity to meet other new families. Meet academic heads, Administrators, faculty, and become acquainted with their roles in the school community and their contributions to student learning and development. Parents are explained about the previous year’s achievements and about the new initiatives, the school is engaging for the current academic year and the school policies for students and parents. 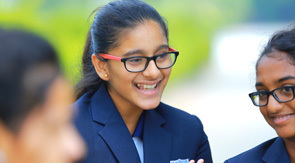 Parents are provided with an overview of the academic and co-curricular resources available to your student at Manchester International School. Learn about a range of student services including housing, student health, safety, counseling, career planning, and the Educational Opportunity Program. Learn about the many ways for parents and families to contribute to the adjustment and achievement of a MIS student, as well as the transition you will experience at home. Find answers to your questions about student life away from home, and the academic and social environments at Manchester International School. Please note that Parent Orientation is only offered in English. While we welcome non-native English speakers, we are not able to offer translation. "Would recommend MIS because of the friendly atmosphere and parent-student-school relationship plus the wide range of activities and learning opportunities they provide for students and even for parent involvement. As Manchester is proving strongly by receiving awards constantly such as No.1 International School in Coimbatore, Tamilnadu... I wish MIS to achieve greater heights in near future."